An earnest remembrance of a friend and the wisdom he passed on to a sports talk radio anchor. Though The Handoff begins with JT’s childhood, we know from the beginning that Andrew will be its focal point. JT failed to take notes on Andrew’s every word in those final months, realizing only in hindsight that he was not only modeling how to live–and how to die–but also sharing all his life lessons, on and off the air. JT may be macho and manly–this is smack-talk sports radio, after all–but he is heartfelt and emotional in relating his love for Andrew and his appreciation of everything his friend had to offer. Although sports radio is JT’s passion and the background for his friendship with Andrew, his readers need not know or even much care about sports (or radio) to empathize. 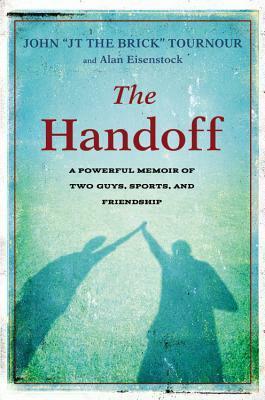 The Handoff is a memoir of life and loss, but foremost of friendship. This review originally ran as a *starred review* in the August 23, 2013 issue of Shelf Awareness for Readers. To subscribe, click here, and you’ll receive two issues per week of book reviews and other bookish fun!